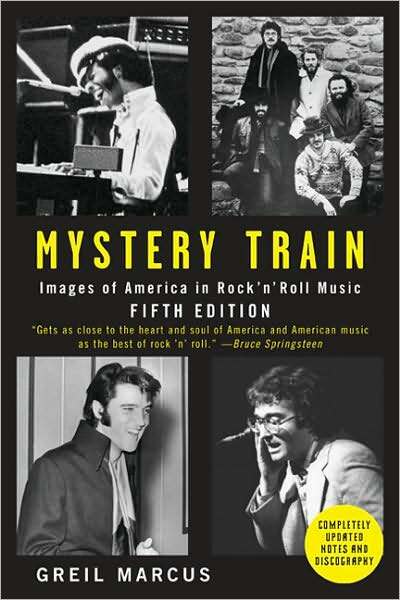 A milestone in musical criticism, Mystery Train: Images of America in Rock ‘n’ Roll Music by Greil Marcus is a demanding read. But for all that is packed into its 177 pages (without the still-expanding “Notes and Discographies” section), it is worth the effort. Marcus says the book “is an attempt…to deal with rock ‘n’ roll not as youth culture, or counterculture, but simply as American culture.” He considers “the compromise between fantasy and reality that fills most of this book” to be the essence of America and being American. These artists–among, but more so than, many others–struggle to balance the contradictory and complementary desires and fears of American society through their music. Marcus links familiar American forms in mind-blowing ways. In the first chapter, he unforgettably compares Harmonica Frank Floyd and Lyndon Johnson to Captain Ahab and Huck Finn. When I read that description again in Mystery Train, the story had another context almost as rich and appropriate as Sun Studio itself.